I like the saltwater taffy from Dollie's in NJ!!! I love love love love this! LOVING the colors, the windmill and the candy piece!!!!! ooo taffy YUM!! and your page is just as yummy!!! Love it! 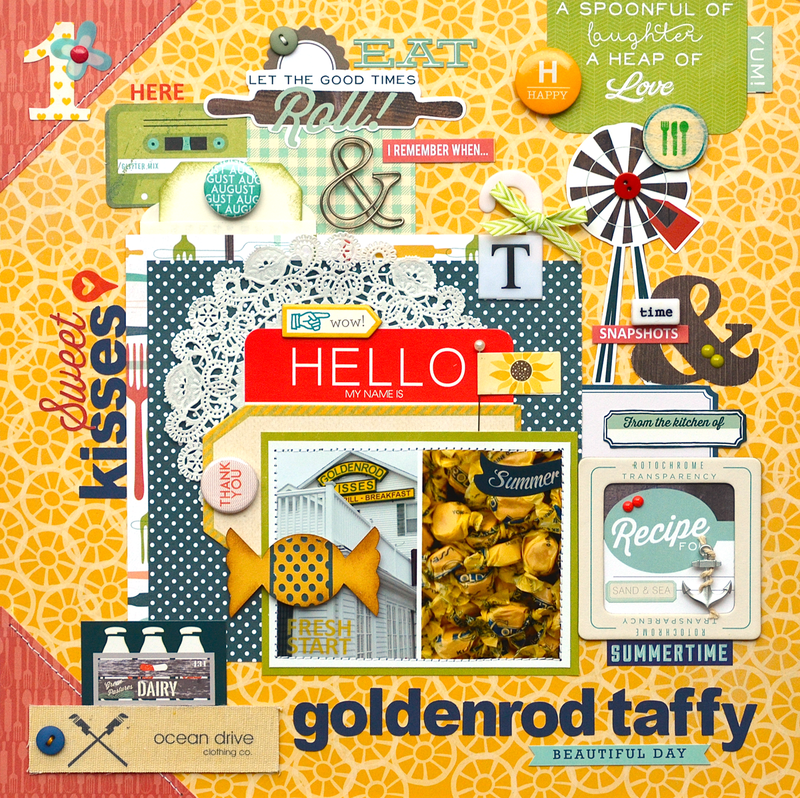 Awesome layout for capturing a childhood memory for both you and your daughter, Lisa, and the taffy embellishment you made is too cute! This new collection is so cute! My mom makes recipe scrapbook pages... she will definitely need this stuff! Gorgeous page! LOVE the "golden" color. Perfect for your subject. And that candy embellishment is yummy!!! This is so fun Lisa! The Made From Scratch collection is perfect with the photos! This color combo is so striking. The navy and yellow combo makes me swoon! Great work with the Silhouette. I had assumed the wrapped candy was a chipboard piece. Didn't know you made it. So cute. I just love this layout, Lisa! This is deliciously fun. I'm that way when I go to certain parts of the state or Europe. There are some things that don't taste the same until you find "the one." so cute lisa!!!! I've never heard of this taffy :) ~ but I'll look for it! Ok, Ok, Ok - there is so much to love about this layout but let me start with the awesome stitched down corners, the awesome titles and the cool quote up in the corner, the colors and patterned papers you chose to showcase your photo!! You just are so impressive in your styling and placement - UBER talented - love you! !